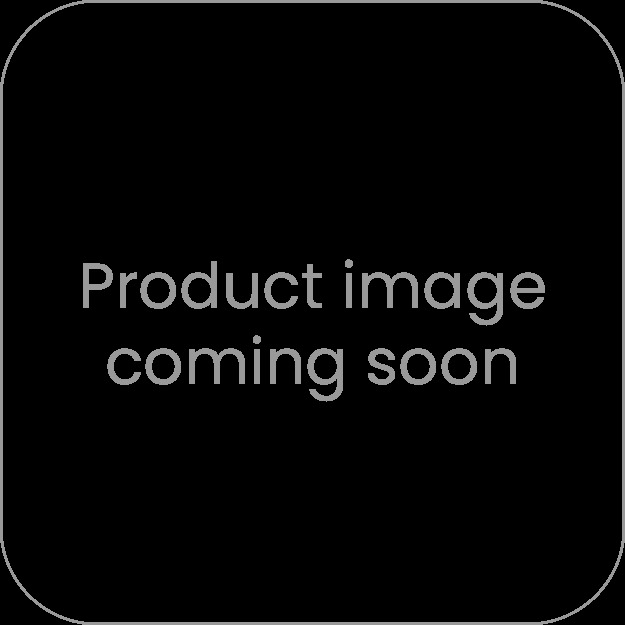 We offer a range of promotional and branded first aid kits. Don't let the "promotional" part fool you, these are fully functional first aid kits which have been extremely popular with lifesaving, medical organisations, volunteer organisations and just about any business where a scrape or an injury could occur. Most of our first aid kits feature multiple bandages, with some of our leaner kits having bandages, medical tape and gauze rolls. While some of our bigger packs feature safety pins, sprain bandages, thread, scissors, sanitising chemicals and even snake bit bandages. Despite the fact our Printed First Aid Kits are considered a promotional item, they’re regularly used by many different types of businesses. You might use them to give out to employees, volunteers or patrons if you have a business where first aid kits might be needed at some point. Sports organisations, medical organisations, and many other types of businesses could use first aid kits with essential items. Having your logo printed on them could lead to years of exposure for your business. Whether you choose a mini first aid kit or you’re looking for a custom first aid kit, we can make sure you find what you need and have it printed with your business logo. First aid kits are often carried by many different people who will want to be prepared in the event of an emergency situation, whether that’s a child’s scraped knee or an adult who’s been in an accident. Every time they carry a first aid kit with your brand on it, no matter the size, you can be sure many other people are noticing your brand, even without realising it or trying to notice it. Since this is a promotional product that’s going to be used often, this can significantly increase brand recognition in the community. The results can continue for years after you give out the first aid kits because they can be refilled and reused. These kits are designed to help your business promote safety and health. They show your recipients that you care about their well-being. These first aid kits are not only a promotional item; they’re functional as well. Depending on what your recipients might use the most, you can obtain the right logo branded first aid kit for your business. Whether you’re looking for a certain size or you need the right supplies in the kit, we offer a number of choices that may be perfect for you. Who Might Purchase First Aid Kits? Sports organisations might hand out first aid kits to their players or their players’ parents. Medical organisations might provide a compact first aid kit to their patients. Teachers, especially at universities, might give them to their students to use while they’re enrolled in school. Travel agencies can use them as a gift for booking through the travel agency. Travel sized kits are perfect for this as they can be taken on the vacation by the recipient and may be seen by others who could wish to book a different vacation in the future. Just about any business or organization can benefit from handing out custom printed kits. They can be given to employees, volunteers, parents, patrons, potential customers, or others who may have a need for a first aid kit and who will likely use it. 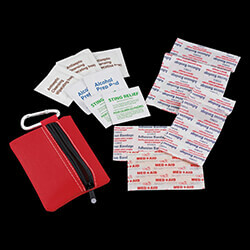 We offer a variety of different promotional first aid kits, from pocket kits to travel kits and larger. Our first aid kits can include anything from a selection of band-aids to sanitising chemicals, a CPR mask or snake bite bandages, depending on what you’re looking for. Our smallest first aid kits are designed to just hold the essentials. They make it easy to carry around a few band-aids for minor injuries or scrapes. Our larger kits include latex gloves, CPR masks, band-aids, metal scissors, tweezers, cleansing wipes, and more. We offer a number of different options, so it’s easy for you to find the perfect branded first aid kits for your business. If you’re looking for something that’s small and easy to carry around, check out the zippered first aid pouch, which is a 20 piece first aid kit, or the on the go red first aid kit. If you’re looking for a larger kit that can be taken anywhere, our deluxe first aid kit or stay safe portable first aid kit might be what you need. Once you’ve found the right first aid kit, we can start producing them for you. Let us know how many Printed First Aid Kits to make and what logo should be printed on them, and we’ll start the production right away. Whether you’re looking for a pocket-sized kit for corporate gifting or you’d like to give away a travel first aid kit to customers, we can help you create the custom branded first aid kit you need. Contact us today with any questions you might have.